Although my wife has been using one for a while, I realized that I have never actually given my impressions of Apple's iMac platform, despite having looked at both their desktop and notebook offerings in my initial wave of Mac articles. 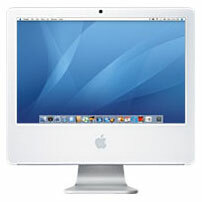 The iMac is an interesting option for the desktop user, as it is very much a "lifestyle" computer, but a very functional and capable one at that. The iMac is the epitome of what today's PC makers simply do not create - and that is a modern, stylish take on the desktop computer. It has been done many times in the past. You combine a monitor with a computer and sell it as one. It was done so frequently and so poorly in the past on PCs that there is now a stigma associated with it, but let's think about that for a moment; some of the worst all-in-one designs came about well before LCD panels became mainstream, not to mention that user upgradability was a much bigger deal back then than it is today. With the advent of the LCD panel, you can actually have some pretty stylish integrated systems, if you design them properly, that is. And the issue of upgradability is far less of a demand today than it was back then for a number of reasons: the rate at which CPUs are released has slowed down tremendously, external storage is extremely easy to add, and if you aren't a gamer, then a good GPU today will last you years to come. 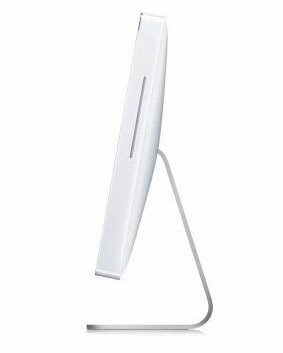 The point is that these integrated designs were mostly terrible in the past, but that doesn't mean that they have to be today. When Apple released the Mac mini, I looked at it and thought that they had struck gold; they basically took a notebook platform, massaged the shape, and stuck it in a wonderful form factor for the casual desktop user. In the process, you lose the ease of internal access that larger form factors would offer, but the end result is very close to the perfect form factor for casual users. With the iMac, Apple has pretty much done the same thing; they've taken a notebook motherboard and processor, although this time combined it with a 3.5" desktop hard drive, and mounted it behind a LCD panel - creating a very elegant desktop computer. The trick to the iMac is in its form factor - although the design is a little bottom heavy, the iMac doesn't look all that much different than your standard LCD monitor. The very positive side effect of the iMac's integrated design is that when paired with a Bluetooth keyboard and mouse, you only have a single cable coming out of the system for power and that's all. The iMac has made it OK for a computer to be on top of your desk again, with as little as one cable coming out of the system - the days of a wiring nest collecting dust behind your computer are over. Granted, this machine isn't for everyone, and I definitely couldn't use it as my only computer simply because I would need a higher resolution panel attached to it, but as a second or third computer, or a computer for someone who just wants the basics (Web browsing, email, documents, music, photos, movies, etc. ), the iMac does suffice. The new iMacs have become very thin; the 17" models that I received were a little under 1.5" at their thinnest point, which happens to be around the outside of the unit. That's thinner than some notebooks! The styling of the systems is nice, but as I mentioned before, they are a little bottom heavy - meaning the lower 4" of the system looks a bit odd and out of place. The low end models come with a 17" widescreen 1440 x 900 display, while the other option is a 20" widescreen and its 1680 x 1050 panel. Personally, I found the 17" model to be a good size; however, the screen resolution was a little low for me. It's the resolution alone, not any of the upgraded specs, that would force me to pick the 20" model instead. For the casual user, however, the 17" should do just fine, especially keeping in mind that OS X tends to do a lot better at lower resolutions than Windows in terms of being able to manage and access Windows efficiently. 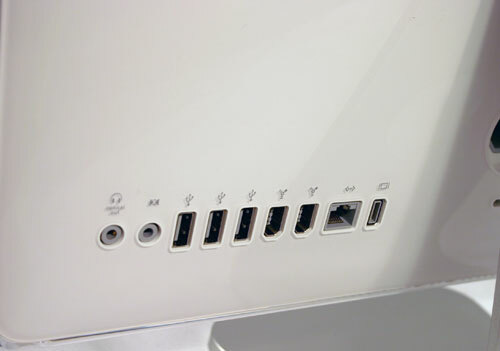 All of the ports are on the back of the system. All of the new iMacs are based on PCI Express architectures. The GPU that you get depends on whether or not you go for the Intel offering. The iMac G5 comes with an ATI X600 GPU, while the Intel iMac ships with a Radeon X1600; as I mentioned, both are PCIe. Apple has done the bare minimum and outfitted these two systems with 512MB of memory. I mention that 512MB is the bare minimum because it honestly is for OS X, but I will mention that one of the first upgrades that I would perform on these machines is to bring them up to 1GB of memory. With only 512MB, there were a number of cases during my normal use of the machines (which, in this instance, didn't include any heavy multitasking) where I found them swapping to disk. Just browsing the web or checking email didn't trigger it, but it was once I started to really use any of the iLife '06 or iWork '06 applications that 512MB quickly became a burden. Upgrading the memory on the iMac is about the only thing that you can do, as replacing the hard drive requires a complete disassembly of the machine (which isn't something that Apple wants end users to do - they would like you to bring it into their stores for those sorts of upgrades). Thankfully, upgrading the memory on the machine is fairly easy. Along the bottom of the machine, there are two screws that you can remove with a small screwdriver. Removing these screws releases a panel that covers either one or two slots for memory, depending on which iMac you own. 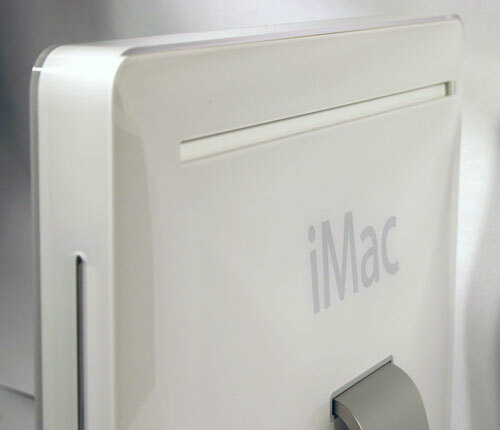 The iMac G5 has a single 240-pin DDR2 slot that is empty and can be used for upgrades, and the standard 512MB is located on the motherboard itself. The Intel based iMac uses 200-pin DDR2 SO-DIMMs (notebook memory), and you can access its two slots at the bottom of the unit. The system ships with a single SO-DIMM installed, leaving one slot free to be populated. The 200-pin DDR2 SO-DIMM in the Intel based iMac.